weekly parkland maintenance and improvements. Unfortunately, we are one of the victims of a careless local weblog that decided to create a controversy with a very successful clean up and wood chip recycling project coordinated by our organization and supported in writing by Public School 277, All American Soccer, Resurrection Softball, Knights of Columbus #5989, The Cort Club, AOH, and the VFW Post 107. The weblog and its negative anonymous commenters’ attacks on our organization, board members and many others in the community is an embarrassment for all that love and care about our neighborhood, and volunteer time to make a positive difference. This has caused a ripple effect of causing other problems for our organization, a lower level of interest from volunteers, and compounded the problems of working within the bureaucracy of government agencies. Right off the bat, the victim card – actually, the entire victim deck is played. GBCares was the little weakling victimized by this weblog. Although we are not sure what a weblog is, it’s obvious they took steps to not mention Gerritsenbeach.net by name which is strange because they had no problem mentioning the website and me by name on their website and press releases. But apparently, the site is the bully. This bullying weblog would like to civilly point out that, despite all the notes of support and approval, I don’t see that the successful cleanup was an approved Parks project…. This bullying weblog would also like to nicely point out that said supporting groups were only asked to write a letter of support after Parks told GBCares to stop working on the parkland. This bullying weblog would also like to politely express that it’s been a full year now since GBCares suspended the community service program. Oh, and not to be rude, this bullying weblog would also care to share with you all that the community service program has nothing to do with NYC Parks request for written approval of GBCares projects. This was an internal decision, which they explain below. Here is my final editorial on the woodchips matter. These comments are directed by a certain someone who has a vendetta against me and this site: Enough is enough. It’s been a year already. Grow up and move on. People are tired of reading about this and I’m very tired of writing about it. Our current problems with NYC Parks started in April of 2009 when new and inexperienced, Park Manager Alex Mezzatesta demanded we stop all major projects and prohibited the use any power equipment or vehicles on the Parkland (try mowing the baseball and soccer fields with a push mower). We explained the activities had always been done with the full knowledge and cooperation of the Parks Department and staff, and that together we accomplished so much over the last decade. He did not seem to be knowledgeable about our activities and successes. So we invited him to visit our storage containers to show him the equipment and supplies we have, and loaned to Parks Department when requested in the past. He was also given copies of old newsletters for background and the 2009 newsletter that was a review of GBC activities that happened in 2008. We hoped he would get a better understand-ing of the thousands of man hours that support the Parks Department each year. He seemed annoyed that we had a better set up of tools and equipment then the Parks Department had for the entire district. We explained it took us over a decade to be as organized and well equipped as we are now, but unfortunately jealousy and closed- mindedness apparently kept him from seeing the larger picture and the benefits to Gerritsen Beach that the Parks Department just cannot provide. Talk about throwing someone under a bus! This is surely not the way to win friends and influence people in the parks department! Giving old newsletters to the park manager to get him to reinstate things is just not a good idea. Calling him ungrateful, jealous and closed-minded, is not going to get you anywhere. Wouldn’t it have been better to have given him an approval letter from Parks? Maybe, if the letter didn’t exist put him in contact with a higher-up in Parks with knowledge of the “approved” program? Wait, I’m bullying again, aren’t I.
Ladies and gentlemen: having the full knowledge and cooperation of Parks is one thing – having Parks turn a blind eye on our community is another. Bottom line: if everything was done with any type of knowledge , none of this would of ever been a problem for the organization. 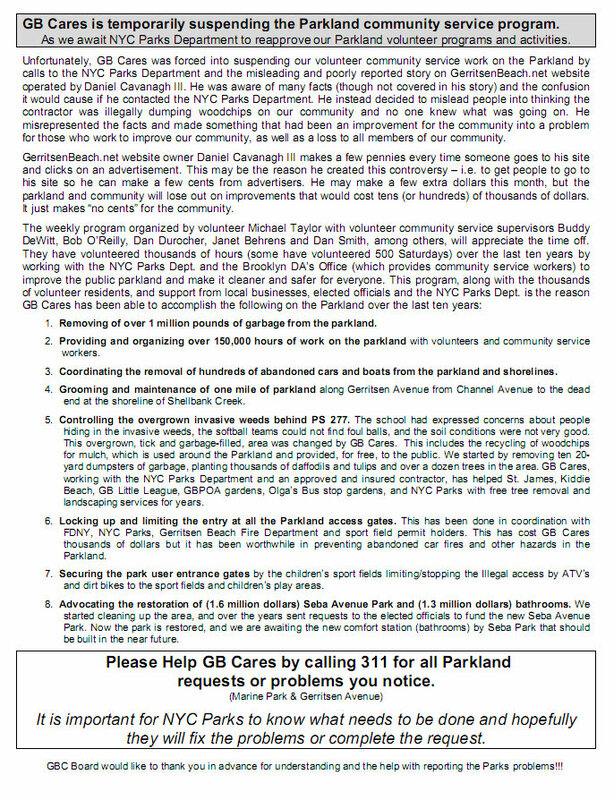 On April 8, 2009 we sent a letter to NYC Parks Department to request re-approval and support for the 46 projects and regular activities performed by GBC on the Parkland. Since we still had verbal permission to pick up garbage and empty the garbage cans we continued with the weekly CS program workers. Then the weblog and its anonymous commenters made entirely baseless claims accusing GB Cares and some of the volunteers of criminal and illegal activities. According to the weblog it was illegal to have the community service workers in the Park. Our Board of Director had many concerns and questions that lead us to have meetings to discuss the concerns with NYC Parks Commissioner Julius Spiegel, Councilman Lew Fidler, and a partner from a large law firm that helps GB Cares with legal issues. On a May 17, 2009 conference call with Commissioner Spiegel he did not have a problem with the community service program workers. We requested something in writing, and sent a request for approval specifically for the community service program on June 8, 2009, with a reminder that we were still waiting for the response to the request for re-approval of the projects and activities that was sent on April 8th. We are still waiting for a signed response from NYC Parks Department for both letters. We have received written approval of many of our activities but the approval was not signed, and everyone knows that an unsigned letter is nearly worthless. To protect our members, volunteers and organization it was decided we would push for a signed approval letter. Back to the criminal accusations: Wait, what accusations? No one made accusations! No author ever said anything like that! As stated above, even the Parks Commissioner didn’t have a problem with the community service program! And rightly so! It’s a great program , And this nonsense about an unsigned letter, they did receive an approval letter, it was their OWN choice not to act on it, so I don’t see what that has to do with anything. Then we had questions about insurance coverage for the CS workers assigned by the DA’s office, volunteer supervisors running the program, and anyone that may need the coverage from an injury related to our activities. The DA’s office verbally explained coverage would be there when needed, but again, they refused to provide anything in writing. The NYC Parks Department wants everyone to sign a waiver of liability through the Partnership with Parks program. This waiver would have the CS workers and volunteers waive any rights to medical coverage, or other compensation, in the event of an injury in any park. This is also unacceptable to GBC. As part of the grant process from NYC GBC purchases a policy that covers the programs and activities funded through a NYC Council grant. Once again, the Council verbally assured us that the programs written into, and covered, by the NYC grant will be insured, but they refused to provide any documentation or specific details of who and what is insured. With these concerns in mind the GBC Board decided to make sure we have insurance coverage by purchasing an addi- tional policy for our events and activities. Unfortunately we could not find an insurance company that would also cover the CS program and workers for a reasonable fee. Finally, some semblance of logic! It’s an issue of money and insurance! All that other blather about bullying weblogs and out of control commenters was a red herring. See, it just took a little bit of critical reading skills to get to the REAL reason why the program is suspended. Maybe the scapegoating will end. But I doubt it. Apparently, this matter will now be taken up with Parks again. I assume an “understanding” will be reached eventually. So we’ll wait and see what else we can get blamed for in the future. I have to say it's funny that you are blamed for atacking them. Everytime GB Cares sends out a newsletter or a request for donations, you post it on here. If you were just out to attack, why would you bother posting the other stuff?! Almost every post has negative anonymous comments. If every organization in GB shut down because of negative anonymous comments, we'd have no Property Owners, no Vollies, no Church, no Little League, no anything. There have always been & will always be people with something negative to say…that's the facts of GB! Now there's a forum where things are spelled out versus the past GB gossip/rumor mill. Personally I think it's a great opportunity to address the GB gossip before it gets out of control. I agree, Bob. Sometimes the negative comments are just stupid, mean spirited ridiculousness. Many times you can tell they come from someone who doesn't live here and they are just looking to bait people or get them riled up. Sometimes although they're negative they bring important issues to light, where they can be discussed. Sometimes people can bring up issues that no one has thought of, or solutions no one has thought of. All in all, communication is good. Supressing it, hiding it, censoring it is just, well, un-American. Driving down the Avenue, the Weeds are overgrown and it looks terrible. Has anyone addressed why it is not being maintained by the Parks Department. This story is old, but it's like the Avenue started looking terrible since these story began. I miss GB Cares and others doing the maintenance. You could count on them. The Parks Dept gets paid for the job, maybe that's the difference. They have no vested interest in the Community. If you look at any parks property now, it all looks the same.. Are they sleeping? I believe there have been deep budget cuts to the parks dept. What makes you think that levels of service can remain the same when hardworking staff that made careers in Parks are replaced with people who are being FORCED to work thru welfare to work programs? I have watched them cleaning etc. and it is like watching paint dry. No wonder that they are a little behind. It makes you wonder how they are going to maintain the new stuff when they can't even keep up with what they already have. What about Marine Park? They STILL haven't finished removing the stumps from the 52 trees that came down in that storm, much less replanting, and yet they are busy planting 2000 more here. Quite simply take a good look at the avenue, park side, from Channel Ave. south to the end. As the opthamologist says…. "does it look better now, or before?". I think I made it very VERY clear, that everything going on now was an internal decision to suspend the program, even after receiving approval both written and verbally, and that it was not GB.net's doing, as you comment implies. After recently speaking with the parks manager he stated they are winding down their tree stump removal at marine park and that we are on a schedule. But when it comes down to it: whoever yells the loudest will get trimmed. In my time running this site I have learned that Gerritsen Beach was never really fully apart of the city, and we did things without knowledge/approval or agencies turned a blind eye. However, we need to understand that we are apart of society and we can't just do things how and when we want them. There are reasons why groups and/or volunteers cant just get on a mower or you know… build a ballfield. Parks is legally held responsible for anything that may occur on that land. We – like any other group or entity in this city need approval. Perfect example: The Olga Garden cleanup and planting event has approval. As for does it look better now or before? Thats a mixed bag. The trimmed area behind the guardrail is a blessing in disguise,I think it is great to walk down and look at. I also feel that it is bringing in attention that the weeds never had before. I personally would of liked 2000 trees next to 277 but for some reason they can't plant anything there for a long time, so they picked across from the library. As I understand it an understanding will be reached soon. It looks better now than it did 30 years ago. Also, the statement "from Channel Ave. south to the end" isn't really accurate. The weeds past the skate park to the point are seldom attended to. Why ais that area Seldom attended to? The entire Avenue was seldom attended too, the weeds used to be up to the Guard rails and hanging over onto the side walks, only time will tell what happpens. I meant even when there were regular cleanups you wouldn't see them weeding & cleaning past Lois. If a wood chip falls in the forest and no one is there to hear it, does it make a sound? If you read the comments made by the departing Parks Commissioner, you would have some understanding of why the Parks Department looked the other way, while volunteers from GBCares kept the Gerritsen Beach end of Marine Park practically manicured. He stated that he did not know one plant or one tree from another–furthermore, he could not have cared less. (His words). He was only interested in convincing politicians to furnish more and more money for his projects. (At a handsome salary, and who knows what additional perks). He was also looking the other way while a contractor, responsible for the care of park trees, (pruning, whatever)… dumped wood chips in the vicinity of PS 277. Whether or not GBCares was implicitly responsible for permitting the dumping is not the reason they had an order to stop work with gas-operated machinery. The responsible party was the Parks Dept., and they avoided any kind of investigation by pulling the chips out from under GBCares. The wood chips are so deep, Parks Dept. can't plant trees in the vicinity. Do you really care, one way or another? Does the work really need to be suspended. Couldn't someone get out there and get the weeds knocked down before it is an eyesore? Has GB every really waited for approval from the city for anything? why start now? That is the point gb.net is making and that is why no one will do anything any more. As you can see he checked to see if there was a permit for the Olga Memorial planting – how said it that, that the community cannot honor someone who made our community more beautiful without the "eye spy" getting involved. I'm not sure if your knocking me but I would like to clarify. I did not check if the Olga planting had a permit, the parks manager brought that up the permit to me, it seems there is a a small working relationship between GBCares and parks. Yes we should be able to honor someone as hard working as Olga was, but I do think we need to do it within the rules, so sanitation or parks won't come down and remove a memorial the community built. If now you are worried about staying within the rules lets get rid of all the other memorials that are not within the rules that have appeared on the avenue. Next time you talk to the parks manager or commissioner request the removal of all unapproved memorials on parkland. Better yet time to start calling 311 to report them. no matter how good the intent is . if something is illegal , its illegal . you seam to have the attitude of as long as were not caught its ok . unfortunately some of our young people have the same idea . breaking up bus stops , selling drugs or racing cars down the ave is all ok as long as no one say's anything . law's are there for a reason . No GBcares and the weeds are growing like crazy again – no surprice there. It's a shame they need insurance to mow the lawn, this is what it come down to now. Sad. 311 works if enough people call. The area south of Seba Park , right down to the beach was cleaned and trimmed by volunteers and com. service workers for years. I was one of the volunteers. I guess "Bob" and others don't remember, or they don't beleive me. The people that live down that way remember, as do the folks who use the Lois Ave. bus stop. Yeah, it warms my heart to see two massive GB egos battling it out over something which is pretty much ado about nothing. You know what bugs me, though? While you dudes are fighting about who has the right to play pick-up sticks on weekends, I'm wondering if this year GB Cares will have the audacity to put up that inflated reproduction of the sinking Titanic again at its Halloween festival on a ballfield named after a firefighter who died on 9/11. But what the hell. Almost 3000 people died on 9/11, while a mere 1,517 (by some estimates) perished when the great ship went down. So I guess it's okay to trivialize that ship disaster since it's only about half the fatality magnitude. Boy, what a bunch of losers you guys are. Tripping over your own egos while people like me stand on the sidelines, write satirical epics about your precious community on Facebook, and hide our smirks behind our hands. I am a little late on the response but I have to laugh at you because I bet you wish you had a neighborhood. You are lost this is our neighborhood you jealous idiot go find your own. If that is what bothers you in this world take the bottle out of your mouth and grow up. Life lost is tragic no matter how many resulted. My tribute to idiots like you lay in the crap infested waters due to TGIF and the UA movie theater. Now there is a real subject to fight over. Maybe you want to go hang out with the rats back weeds instead. Go tend to your neighborhood or do those losers not even care that is why you mind ours.